This highly concentrated cream combines our powerful AP4® Aloe Vera Complex, vitamins and essential botanicals to help make it the perfect multi-purpose skin healer. A cortisone free formula for use without side effects. Non-greasy, use daily to help provide the look of moisturized skin. Our best selling cream for 25 years! This highly concentrated cream combines our powerful AP4® Aloe Vera Complex, vitamins and essential botanicals to help make it the perfect multi-purpose skin healer. A cortisone free formula for use without side effects. Non-greasy, use daily to help provide the look of moisturized skin. This product is a miracle healing cream! I use it myself as well it on my daughter as you know toddlers are always falling! The reason I bought this product was to help for my diabetes in skin care for feet and hands I am very happy that Triderma product help me I shall continue to use Triderma for all my skin needs. It works very well. I have scaring acne and it cleared up everything. Aloe based creams are so different from eachother. Many contain ingredients that ruin the calming effect aloe provides. Triderma uses aloe as the barrier base and understands how important formulation is for atypical skin. I highly recommend their products to everyone. I bought this after getting a sample tube from a friend. It was amazing with my eczema and c section incision. I have tried many hand creams and only this one heals split skin from cold weather and dryness. This product gives excellent results used daily. I will order again. I bought this product because everything else that was prescribed by my dermatologist did not work. I figure this product could not be any worse. I tried it and I love it. It stops the itching and spreading. I use it regularly. I have since bought a second tube. Being diabetic your skin feels dry and itchy all the time, so this intense fast healing ointment give my feet a happy feeling. I have been using the Triderma Intense Fast Healing Cream for the past couple of years. I really love it! It is a necessity for us. I keep some all the time. I use it to heal and soothing itchy, dry skin, as well as burns, bruises, scars and sores. Most recently I had a surgery that left me very irritated in the perineum and lead to severe constipation. I used the Intense Fast Healing regularly for several days, and it got me healed and feeling better! I am even more thankful for this wonderful product than ever before! I have tried the Eczema Fast Healing, Bruise Defense Healing cream and Foot Defense Healing Cream and I love them all! I highly recommend these products! They work! Thanks TriDerma! I used this product because of my caregiver request. We are always trying to help my sheering problem. Seemed to be better than most I have tried, still was not the miracle cream we hoped for. This product is also very expensive. Price wouldn't matter if it worked better. This lotion healed my sores so fast, it was amazing!!! I use nothing else. Thanks for the amazing product, which helped heal my constant dry skin. I am glad to be rid of the constant irritation and redness created from painful dry patches that were hard to resist the urge to scratch. No more itching or burning, noticeable dry spots! I have developed Lichen Planus on my legs. Very expensive Rx creams did nothing. I had some of this that had helped with healing after some skin biopsies, so I tried it for the Lichen Planus and it has worked! Provides fast healing to acne-related scabs as well as moisturizing benefits. I was searching on line for a product that would clear a open sore that would not heal. I have purchased several products that would not work in healing the sore and decided to try your product. After just a few days, my sore was clearing. I will not waste my money on any other products. Triderma is now my choice for all of my skin care. Wish the Triderma products were sold in my drug store or department store but cannot find it anywhere only on line. This non-greasy, fragrance-free, medical strength over-the-counter cream is the BEST cream I have EVER tried!! It works PERFECT! I was EXTREMELY satisfied and will make this my regular cream for my hands!! Bought this for my gdaughter, schools make the Kidd use hand sanitizers through out the day...and her hands get horribly raw that they crack n somewhat bleed. So I'm praying this will help clear her hands. School has been notified!!! This product helped heal a small ulceration on a toe. This has worked so well for me. I am totally surprised because other products have not. This product has worked wonders! Would tell everyone about it. Thank u. Thank you for this cream. It's amazing! I had bilateral knee relacement 6 weeks ago. The PT wants me to exercise my knees by bending them. How could I, when bending them feels like my incisions are going to bust? Then a friend gave me a sample of your Intense Fast Healing Cream. After only 1 application, the scars softened and didn't feel like busting. The cream also got rid of dried skin and scabs. I immediately went online and ordered a tube of this wonderful cream. Would recommend to anyone. This product has helped me with my severe radiation burn on my neck. 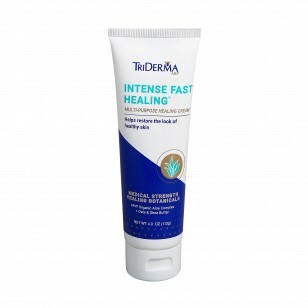 Triderma's Intense Fast Healing Multi-Purpose Healing Cream is the very best cream I have ever used. It truly does heal cracked, dry skin. It is not greasy and soaks in instantly. Would recommend it to anyone suffering with eczema/itchy inflamed skin. I received a sample packet of this cream with an order of Extreme Dryness Plus. When I scraped my arm, I gave it a try and was amazed. It works MUCH FASTER than traditional first aid creams and without any antibiotic use. It immediately soothed the spot and in 3 days, the scrape/cut is completely healed- a real miracle on my sensitive skin. Will use this from now on for all scrapes/cuts with confidence. Definitely highly recommend. A couple of years ago, I was in Palm Springs area and went to the College of the Desert street fair. There was a vendor selling solutions to problem skin. I had been suffering from an itchy back for a couple of months, and even went to my doctor, who said he couldn't diagnose any issues. He suggested changing soaps and shorter showers at lower temperatures. Nothing worked. At the street fair I purchased a jar of the intense fast-healing cream. I used it on my back, and within a couple of weeks it solved the problem. Now that my skin is aging, I use it regularly on any areas of my skin that exhibit dryness. I use it daily on my lower arms, as they have suffered sun damage through the years, and the cream keeps my skin more supple and younger-looking! Thanks for a great product. I have used this product for bug bites, burns, really bad ezcema patches, cuts, blisters, etc. works great, cuts healing time down, soothing, takes away the hurt, burn, itch etc. My family thinks it works better than other OTC products like it. Thank you. I love this cream - it is great for sensitive and dry skin. I will never use another product. i have used the Intense Fast Healing cream on my hands, face and body. i found that it absorbed well. it also did not leave the skin greasy. the cream was thick but absorbed well. i used it on my face for rosacea, and minor skin irritations. i also used it on my hands after doing yard work. the cream helped with cuts and scratches on my hands from working in the yard. it is a go to cream for almost any problem. I have very mature dry sensitive skin that is plaqued with all kind of skin problems. Seborreic Dermititus, Skin Allergies etc. Everyone knows as you get older it takes forever for your skin to heal. This is the best product line I have found for quick healing and I will never be without it again!!! A MILLION THANKS FOR CREATING THIS! Love this product. It is always great to use anywhere to moisturize and quickly heal. I use it on blisters on my feet! I seriously love this cream and feel lost when I run out of it! It's not greasy and leaves my skin super soft after I apply. I actually use it twice a day as a moisturizer underneath my makeup. I can tell that my skin doesn't like when I have to use something else (because I ran out of the Intense). For my face, I only need a quarter size amount for full application. This is also my go to cream for any weird rashes or bug bites. I hope this cream never goes away! Thank you TriDerma! I was reluctant to try anything new at 1st. I have a seasonal issue on my hands that really hurts. My skin drys badly & just cracks along the creases inside the palm. I have a physical job & my biggest tools are my hands. My wife put this on my hands at night & said if nothing happens in 2 days, she'll stop. I think you know what happened next. We consider this a MUST HAVE all year round! Thank you. Had a very nasty case of cellulitis & had no clue what it was at 1st. Bought a tube of this @ local drugstore & to our shock it was the ONLY PRODUCT that worked! After researching the ingredients it made us want to try even more Tri-Derma MD! Used it on my Labrador when his nasal glands started to dry his nose- worked great! 1 of my felines has a rare disorder & healed her too! Amazing! Apply generously to the affected area at least twice a day. Safe to use on children and any delicate or sensitive skin area. Daily use helps maintain healthy skin. aloe barbadensis (aloe vera) leaf juice*, cetearyl alcohol, isopropyl palmitate, polysorbate 60, beeswax, dimethicone, allantoin, zinc PCA, avena sativa (oat) kernel flour, sodium PCA, panthenol (vitamin B5), butyrospermum parkii (shea butter), tocopheryl acetate (vitamin E), cetyl alcohol, sodium phytate, sodium hydroxide, phenoxyethanol, ethylhexylglycerin. "About 5 years ago I had shingles and I was in so much pain that I went to the drug store to find something to relieve my misery. I came across your Intense Fast Healing Cream, bought it, went home and put it on my rash. You have no idea how much it helped. I honestly don't think I could have survived without it. A few years later a freind also had shingles so I went and bought her some and took it to her so she could get some relief. She also made the comment that she couldn't have made it without it. I just wish more people knew to use it for shingles." - Nita A. "I used this product on an incision wound that was taking forever to heal. I had surgery in May 2009 and due to being ill and having a very poor immune system, by my second surgery in December, the wound still had not fully healed. It was still raw skin, and I was gauzing and taping it up every day. They used the same incision in December, and I was faced with another long bout of poor/slow healing. A couple months later (March 2010) I came across this product. I have been using it now for 3 weeks maybe? And the incision has healed more in the last 3 weeks than it did in the last 10 months!! I was blown away!! I HIGHLY HIGHLY HIGHLY recommend this product." Mel E.
"TriDerma Intense Fast Healing Cream helps heal pressure sores fast. It is non-greasy and light enough to be gentle on my 92-year-old mother's skin, yet strong enough to do the job. The cream is also useful as a prevention tool. If one is taking care of an elderly person TriDerma is a must." Terrel R.
"This is such great stuff! Keeps my rosacea away, use it everything...breakouts, dry skin, (sun)burns, bee stings. Works for and is easy on the dog too. A little goes a long way so a jar will last several months." J. "I came out of a leg cast after six weeks with a Stage I pressure sore on my heel and some very tender traumatized skin on my ankle. This cream has been very effective in soothing and healing the traumatized skin, the surgical scar areas, and the pressure sore. There has been a significant diminishment in heel and skin redness/tenderness, as well as a relief of the "burning sensation" on the ankle skin. The skin is now soft and much more comfortable. I'm applying at 3x a day after range-of-motion exercises, and one final time before bed. There really is no added fragrances for those who need unscented products. The smell is faint and pleasant. The texture is creamy without being greasy. The 4 oz jar will probably last 2 months or more using it 4x's a day. I would definitely recommend and buy this cream again." Karalane W.
"I have dishydrotic eczema on one foot that has been itchy to the point of making me insane. It looked and felt so bad. Dry, itchy, flaking skin, red... angry looking thing that had not healed up in two years. I have tried everything, cortisone cream and shots, vaseline, coconut oil, lemon, olive oil, something the naturopath gave me.. on and on, nothing worked. Found this cream and have been applying it throughout the day. At night, I put it on THICK and then wrap my foot lightly in handiwrap (plastic wrap) to hold in moisture (I highly recommend this, it really helps, I wear a sock to keep it all in place. ) My eczema is almost gone now, my skin looks 'normal' for the first time in two years. I am ordering at least two bottles of this now to replace the one I have used up. I hope they don't go out of business, I am thrilled with this product!!! " Judith J. "Have used this for decades... This product with Genuine Virgin Aloe, healed a cold sore in two days, when may other products I tried didn't work for 2 months! May sting if used on open sores, but absolutely awesome for skin conditions! A main stay in my life!" Vicki H.
"I've used this healing cream in the past with excellent results. This is the only product I've used on my cracked, peeling, scabby, elbows that ever cleared up the problem. If I could, I'd give it a 100 star rating. " Thomas T.
"I have a handicapped son who spends 12 to 16 hours a day in a wheelchair. He is prone to pressure sores on the buttocks. As I see one starting, I apply TriDerma cream and the sore is gone in a few days. I recommend TriDerma Intense Healing Cream to anyone who takes care of a handicapped person. " Marvin S.